As the VR web grows, we explore the scenarios that browser-based virtual reality enables, and dive into the new tools and frameworks that have evolved alongside it. 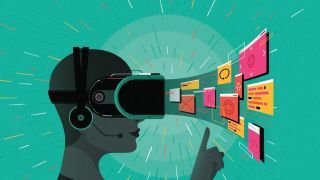 In the earliest days of the WebVR API, support was limited to beta builds of Firefox Nightly and Chromium, and browsers required additional plugins to run content built for immersive headsets. Developers faced significant performance challenges to hit VR-ready framerates that would match the 75-120fps benchmark offered by native apps, and a lack of visual development tools made environment creation difficult for new programmers. In the past, browsers were only able to serve 2D sites constrained to a fixed layout. As the mobile revolution enabled more consistent access to information, the web grew to adopt this, and progressive, responsive applications have led to increasingly powerful websites. Now, with the WebVR API, a website is no longer constrained to a device: it can be an entire world. Let’s step inside. The WebVR API, which hit version 1.0 in March 2016, is a browser specification that has been submitted to the W3C for consideration as a standard to define how VR devices will interact with web applications. It provides an implementation for browsers to communicate with attached VR hardware – or in the case of smartphones, read data about the state of the underlying device and pass it into 3D applications so it can then be used to render WebGL scenes in real time, stereoscopically, to the user. At the core of the WebVR API is the VRDisplay interface, which abstracts out the differences between desktop head-mounted displays, mobile devices and additional peripheral devices, and represents them as a single entity to the developer. These headsets can then be queried for their presentation and connection status, which allows the browser to detect the state for an application to use to determine how to render the scene. The VRDisplay object also returns information about the state of the headset at any given time (such as when the user looks around) via a VRPose transform. This data can then be applied to a virtual camera within a 3D scene. With mobile VR experiences, the VRDisplay parameters are generated from the properties of the phone and the rotational tracking is done via the internal gyroscopic sensors. Dedicated desktop headsets such as the Oculus Rift or HTC Vive will return information about the user’s current viewing state, as well as data around the user’s position gathered by the external sensors that track where they are moving in the physical 3D space. Optional peripheral devices, such as game controllers or room-tracking base stations, can be mapped out and surfaced to a web app through the VRDisplayCapabilities dictionary. Because of the variety of parameters in display technologies, the WebVR API provides an interface through which to gather information about a given display device when a page connects, in order to allow the scene parameters to reflect that device’s technical specifications. Developers working with the WebVR API directly should ensure they are properly querying for the different supported functionality between devices, and plan their application interactions accordingly. When implementing functionality supported by the WebVR API, some traditional elements of a web graphics app are replaced by VR-specific function calls: window.requestAnimationFrame is replaced by a VR equivalent that updates at the frequency of the VR device (often 90Hz or higher), and user agents may use predictive technologies to estimate frame data information. The actual display information of a given headset is calculated through the VRLayer attributes, which specifies the right and left bounds of the display and handles the image distortion based on the parameters of the device.